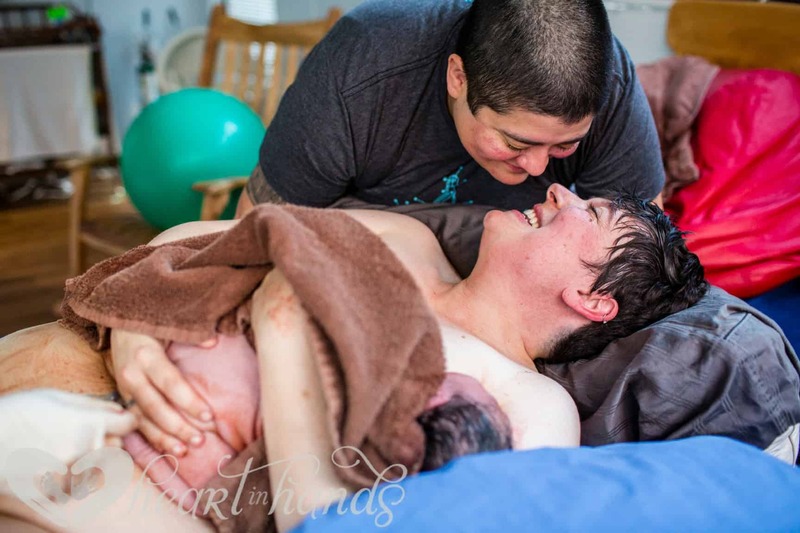 When I first saw one of Emily’s birth center birth photos, I had to hear her birth story. As you can tell from these images, the love between Emily and her wife is palpable! 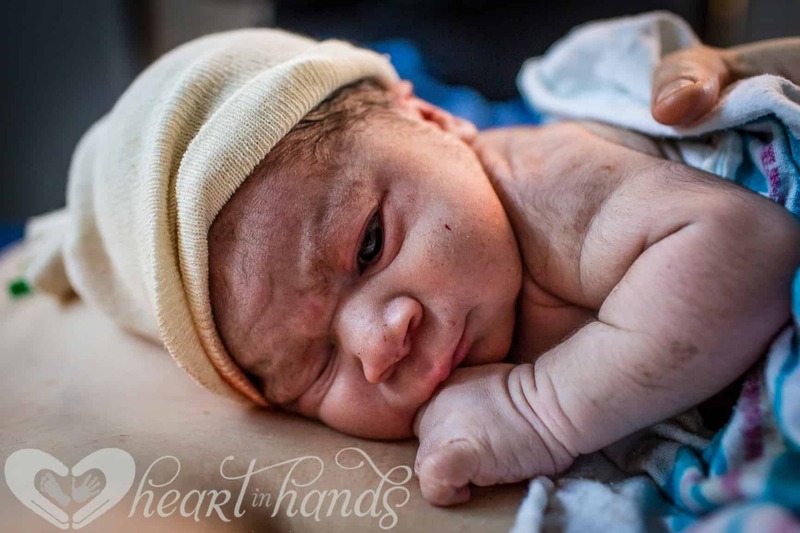 I’m honored Emily wanted to share and I know their birth center birth story will capture your heart. Our kid finally came to us after three years of discussion, one year of donor hunting, two years of IUIs, and one miscarriage. The night before I got the positive pregnancy test, I had a dream. It was set in our house. There were no dirty dishes. No dogs running around. Just a little boy with brown hair standing by our coffee table, waiting calmly. The two best things I did for myself as a plus sized pregnant person were to get my prenatal care with a group of midwives at the Women’s Birth and Wellness Center in Chapel Hill. 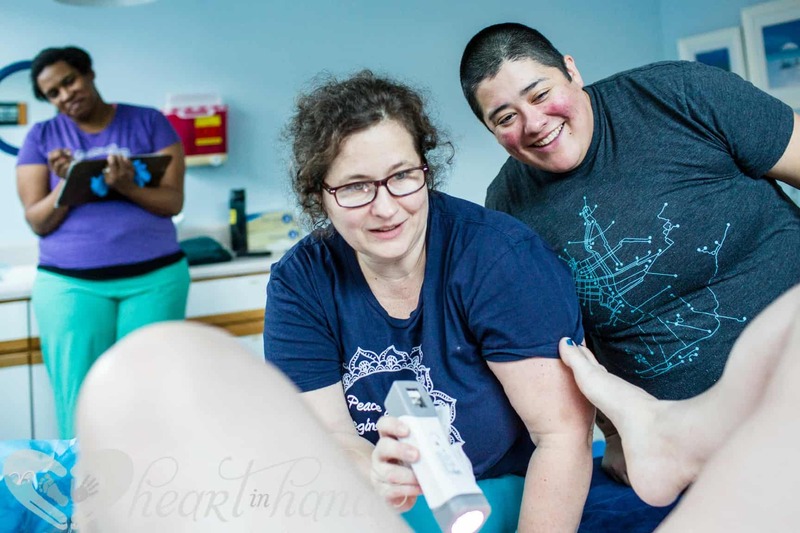 As well as hiring a doula team through a local group in Durham called Emerald Doulas. Going into my pregnancy, I was already several pounds heavier than I felt comfortable and scared that it was only up from there. At the beginning, I worried constantly about my health. Yet at every checkup, the nurses and midwives would check my blood pressure, listen to the baby, and feel my belly. The first question at every appointment was “how do you feel?” They never mentioned my weight because everything else looked and sounded perfect. Our doula team of Ashley Collins and Kallyn Boerner were amazing. 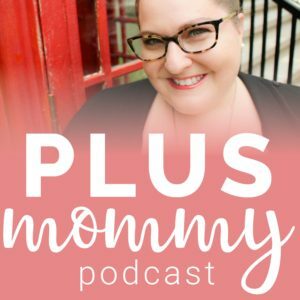 They were available throughout my pregnancy and answered loads of nervous momma questions and helped us create a birth plan. They constantly reminded me that I was capable of birthing the way I wanted to birth – that my body was strong and fierce, and totally capable. I wouldn’t have felt nearly as confident heading into the home stretch without them. My estimated due date was December 22nd so on December 21st, I tried everything I thought might kick-start labor. I ate spicy food, used a little extra evening primrose oil, chugged red raspberry leaf tea, and walked down the street with one foot on the curb and one on the road. Yes, it looked as odd as it sounds. That night we went to dinner at our friend’s house. I told them that I’d dreamt about my water breaking in their dining room on their beautifully upholstered chairs. Thankfully that didn’t happen, but my contractions totally kicked off during dinner! I texted both Ashley and Kallyn to let them know what was happening. Kallyn was the doula on call the next day, which I was excited about because she’s pretty much equal parts comfort and magic. After telling her that contractions had started, but that nothing felt urgent, I fell into bed and crashed. At 1:30 am, a contraction woke me up. It felt different than the ones I’d felt before – it was much more intense. All I wanted was our bathtub. The water felt incredible but it wasn’t enough to keep my mind away from the panicky “oh crap” thoughts that, I’m assuming, most women have as they’re faced with birthing a small human. My wife, Meghan, heard me crying around 2:00 am and came in to check on me, contraction timer in hand. In 30-minutes, my contractions jumped from 10-minutes apart to 4-minutes apart. Yowza! Meghan anxiously texted Kallyn as we officially exited our “making decisions” comfort zone. 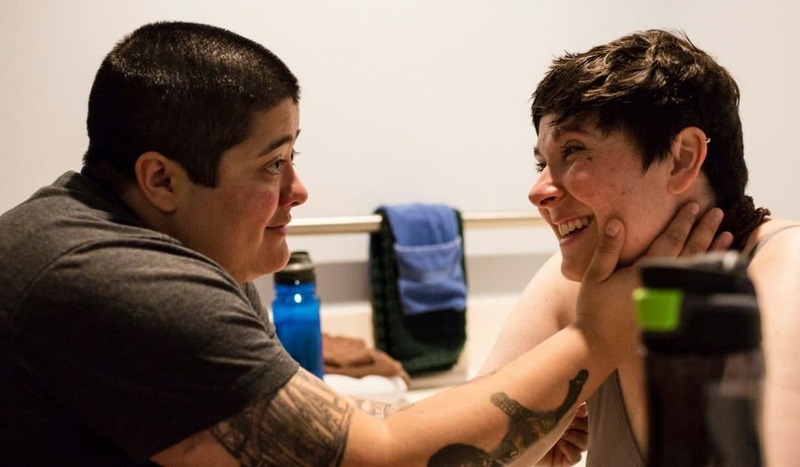 We had an hour ETA for the arrival of doula magic and a go-ahead from Carey, the midwife on call at the birth center, to come in whenever we felt like it was time. While we waited, contractions began to feel like waves that took my breath away. During every contraction, I scrambled to all fours, took a ridiculously deep breath, and chanted “ohhhhhhhhhhhhh” as long as my breath would last. It was the most primitive thing I’ve ever experienced. In the middle of everything, I remembered my therapist telling me that pregnancy and birth are the ultimate acts of surrender. So I surrendered. My body took over completely and I did what it told me to do. Timing was perfect. Kallyn showed up just as I’d gotten to our bed, post-shower, post vomit, and post pajamas. I remember hearing her come into the house and up the stairs, then paused outside our bedroom door, allowing me to finish one of my “ohhhhhhs.” I learned later that, just from hearing my voice, she knew it was time to go to the birth center and encouraged Meghan to pack the car. She came into our bedroom, squeezed my hips, and rocked with me through the next contraction. I knew we probably could have gone to the birth center earlier, but mentally, I needed Kallyn to confirm that it was really time. It didn’t take her long to do so and she slowly helped me off the bed, into my warm socks, down the stairs, and into the car. It was 4:00 am and the only place I wanted to be was on all fours in a bathtub but, unfortunately for us, we skimped and didn’t get the Prius with the passenger side bathtub option. During the 20-minute car ride to the birth center, we narrowly avoided hitting a family of deer and Meghan’s arm became my seatbelt while I was on my knees facing backwards, “ohhhhhing” and clutching the reclined passenger seat. We pulled into the Birth Center lot at 4:20 am and Carey and Tianna (our nurse) had already arrived. We were the only family there, so while Kallyn helped me to the door, Meghan chose the room our son would be born into: our favorite – the blue room. At intake, I was 5 cm, and headed straight into the tub. One of the things I love most about the birth center is how hands-off they are. In our birth plan, I asked that there be as few people in our room as possible. So for the next 3ish hours, it was just me, Meghan, and Kallyn in the room, with standard heart rate checks every 30-minutes. I labored from 5 to 9.5 cm in the tub with Kallyn’s hands on my back and Meghan on water bottle duty and cheering me on. With Carey’s guidance, I chose to get out of the water after a slight heart rate elevation was detected in our son. Transitioning to the bed at the exact time my body wanted to push was mentally rough for me. I’d told myself that the bed was the last place I wanted to give birth – that it was uncomfortable and unproductive. However, I also wanted to make a decision that was best for both of us. It wasn’t an emergency, but an elevated heart rate wasn’t good for anyone, so I reluctantly got out of the tub and set up shop in bed, anticipating that leaving the warm water would help his heart rate slow down (which it did). At some point in the midst of this unwanted transition, I remember watching Kallyn open the blinds and let in the winter morning light. We all knew he was almost here and that this sunrise would be the one that saw him into his first day with us. In the middle of all the intensity, it was a small and beautiful moment of peace. At 8:13am, after roughly seven hours of labor, I caught our son. Our totally and completely perfect little brown-haired boy. 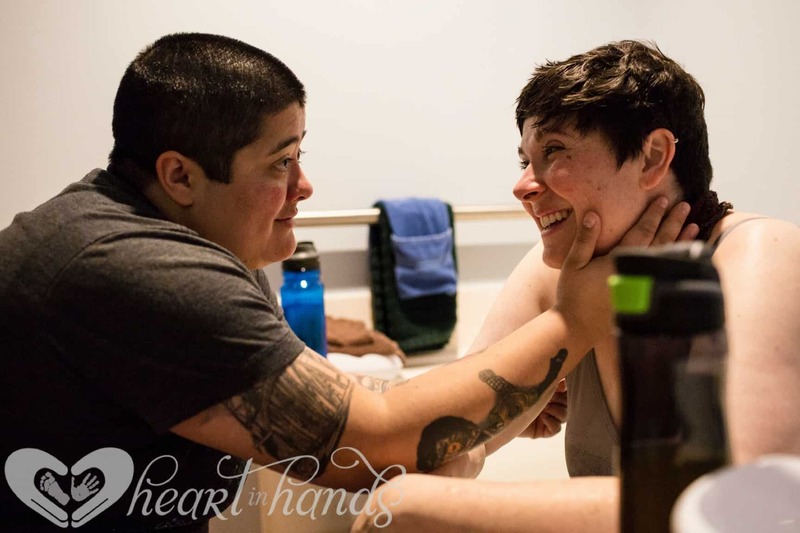 Photos by the incredibly talented Kallyn Silver Boerner of Heart in Hands – follow her on Facebook and Instagram. 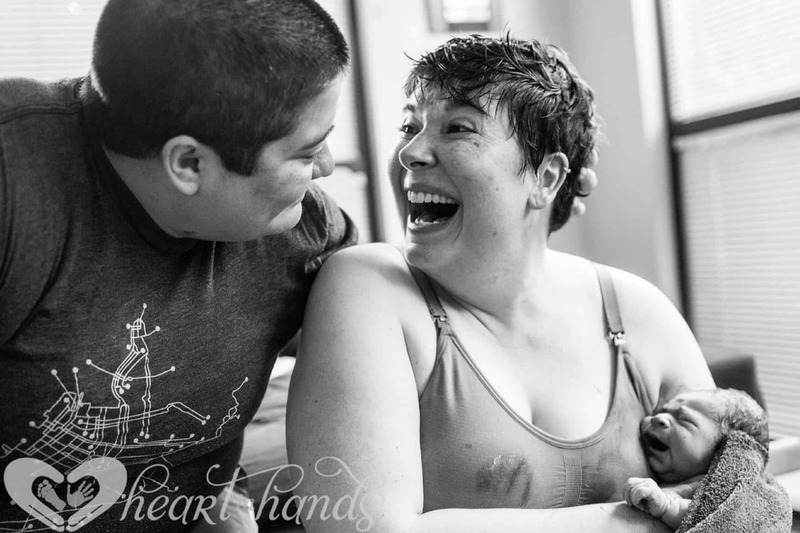 Please Note: Unfortunately, not all plus size people who desire a birth center birth are able to have one. Many states and facilities have BMI restrictions. Be sure to inquire in advance before scheduling an orientation. If you’re looking for a compassionate provider, download our free guide to finding a size-friendly provider.